These are the tombstones of Johann Christopher Bernhold and his wife, Maria Angela Mehring, who are buried in St. Augustine Cemetery in Minster, Ohio. They are my husband's 4x great-grandparents through his paternal grandfather's (Schroeder) line. The Bernhold family settled in the German immigrant community around Minster, Ohio, where they ran an average-sized family farm. 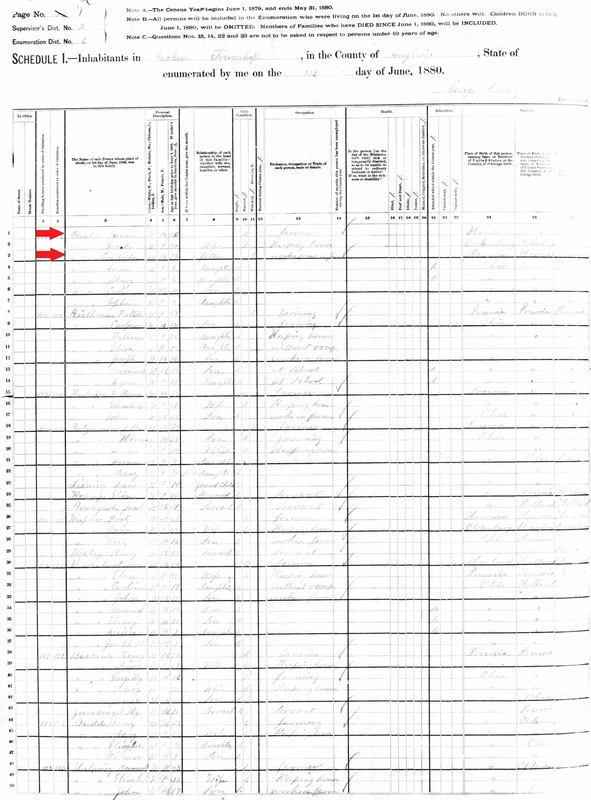 By the 1870 Census, Christopher and Angela were living with their son, Herman, and his wife. Maria Angela passes away in 1874, but Christopher is listed in the 1880 Census, still living with Herman. That census form is difficult to read, but it states that Christopher, at about the age of 80, still "works some on farm." Photo source: FindAGrave.com; photographed by Crashlan. Her death certificate also mentions that her father's name was Bernard. 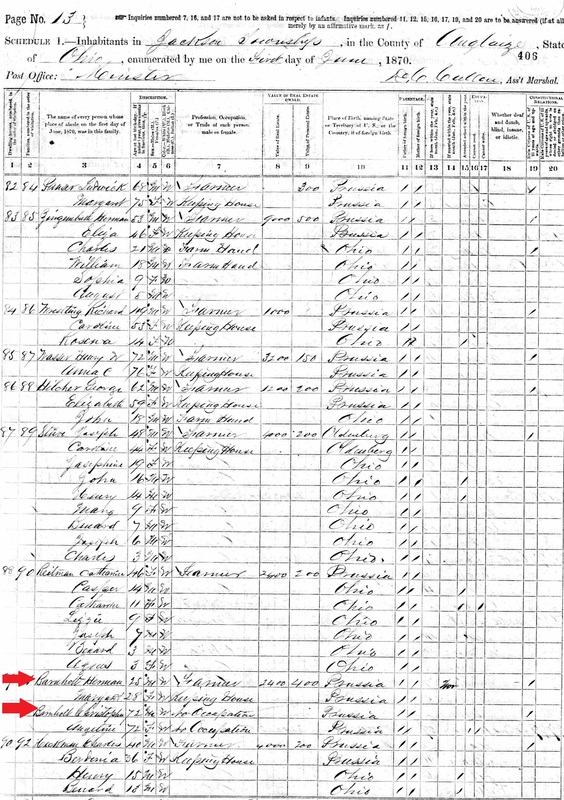 There is a record of a 'Bernard Johning," age 53, in Auglaize County in the 1850 U.S. Census. He is listed with his wife Catherine and one daughter named 'Lena,' who is listed as being ten years old. It says he and his wife were born in Germany, but that their daughter was born in Ohio. I am pretty confident that this is the Janning family I am interested in. I have also found an index of people buried in the "Old Section" of St. Augustine's Cemetery in Minster, Ohio. In this index, there is a record of a Bernard Janning who was born in 1796 and who died January 5, 1851. This date of death would explain why I am unable to find him in any future census schedules, although I have not located an actual record of his death (yet). This 1860 census schedule lists a 60-year old "Catherine Bernholt" living with Frederich and Lena and their young daughters, Catherine and Mary. Even though the surname is incorrect, I'm pretty sure this is the widowed Mrs. Janning: the age matches, Frederick's mom was not named Catherine (and I found her elsewhere in this census, anyway), and older widows usually went to live with family members in this period.